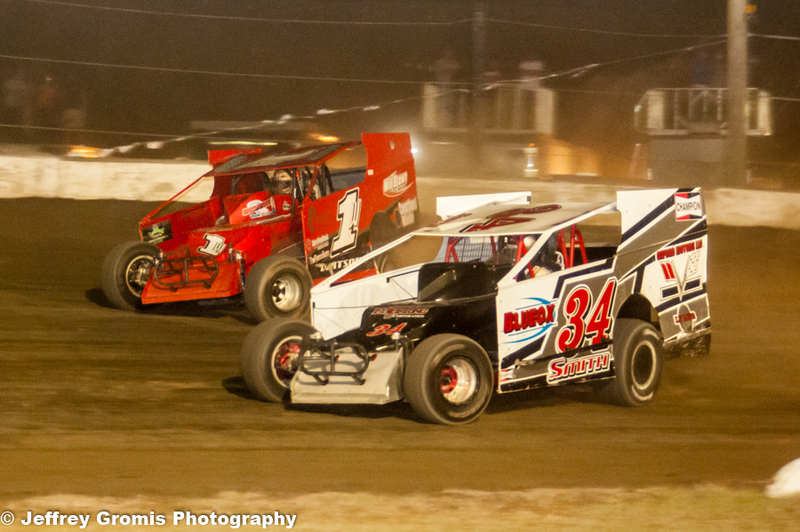 AFTON, NY – For the 10th time, the “Working Man’s Race” lived up to its name. 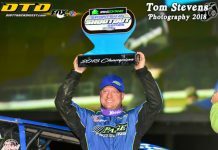 Rusty Smith of Oxford, N.Y., defeated a field of 60 big-block/small-block Modifieds to win the 10th annual American Racer Cup Short Track SuperNationals at Afton Motorsports Park. 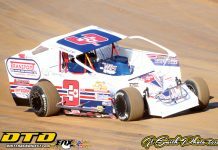 The win for Smith – worth $5,000 – became an instant career highlight since he made the transition from pavement Modifieds to the dirt running weekly at Afton. Beautiful weather brought out the season’s largest crowd at Afton. The fairgrounds facility was bursting at the seams with spectators and race cars for the Saturday program. 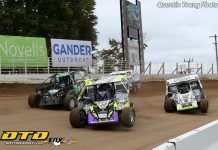 Smith thrilled the locals with his performance in the eighth round of the Bob Hilbert Sportswear Short Track Super Series (STSS) Fueled By VP Halmar International North Region. “This is what the race is all about,” Smith said. “There are a lot of really, really good cars in the pits, but it gives a guy like me a chance to win a big race. 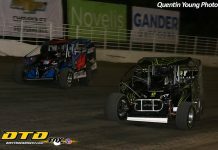 In a late moment of drama, Duane Howard – who was scheduled to start from the pole of the 50-lap STSS Modified main – was forced to a back-up ride due to contact sustained in the American Racer Cup one-on-one match races earlier in the night. That put area Sportsman star Kevin Jordan on the point to lead the 29-car field to the green. It was Delaware star Jordan Watson, however, who powered into the lead by the completion of lap two. As Watson led, Smith shot into second on lap four. 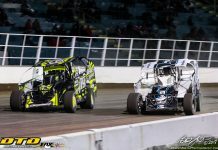 Smith gradually closed on Watson – making his first-ever New York State Modified start – and took over the top spot on the 11th lap. 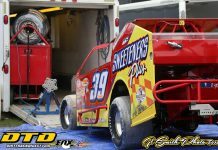 Pennsylvania small-block Modified star Mike Gular had picked the worst available number – 13 – in the redraw. Gular was on the charge during the race’s opening laps and put his Terry Fasnacht-owned No. 2 into second on the 15th lap. Track champion Andy Bachetti also became a factor during the race’s mid-stages. Bachetti wound his No. 4 up on the topside of the speedway. After an extended side-by-side battle, Sheffield, Mass., star Bachetti cleared Gular on the 30th lap for second. With lapped traffic looming, Bachetti looked to close on Smith. A yellow – timely for Smith – provided clear track. After the restart, Smith pulled away while Bachetti was left to battle once again with Gular. A final yellow on lap 45 gave Bachetti his final shot. Smith was too strong and pulled away to a crowd-pleasing checkered. 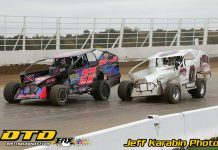 Bachetti settled for a runner-up finish but did extend his lead in the STSS Halmar International North Region standings entering the October 19 finale at Orange County Fair Speedway in Middletown, N.Y.
Boyertown, Pa.’s Gular – making a rare Empire State start – was a happy podium finisher. The second-generation driver authored his drive utilizing a PA-legal spec head engine. 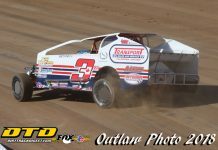 Inaugural Short Track SuperNationals winner Mike Ricci of Tillson, N.Y., drove a ‘throwback’ No. 17 paint scheme to fourth after starting seventh. 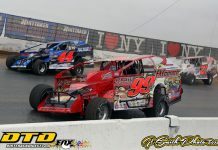 Rich Ricci Jr. of New Paltz, N.Y., filled out the front five in the family owned No. 406. Finishing sixth through 10th, respectively, were Bobby Varin of Sharon Springs, N.Y., in the Alton and Carole Palmer No. 76 after starting 15th; Nick Nye of Groton, N.Y., after starting 11th; 22nd-starter Billy Pauch Jr. of Milford, N.J., driving the Danny’s Pizza Pizzazz No. 51; early leader Watson of Milford, Del; and track regular Brett Tonkin of Carbondale, Pa.
Heat winners were Rich Ricci Jr., Nick Rochinski, Watson, Gular, Allison Ricci and Nye. Three consolations set the remainder of the field with Mitch Gibbs, Cory Costa and Pauch Jr. annexing the 10-lap victories. Representing Bridgeport (N.J.) Speedway, Ryan Watt of Boyertown, Pa., topped the American Racer Cup Champion’s Challenge one-on-one match races. Watt defeated Duane Howard in the final round for the $2,000 payday. Passing for the lead with just two laps remaining, Dylan Cecce took the victory in the 20-lap Trackside Products Street Stock main event. Cecce worked the extreme inside line to slip beneath Earl Zimmer coming to the two-to-go signal. The win for Cecce came in his first-ever Afton appearance. He took $1,000 back to his Woodhull, N.Y., home. 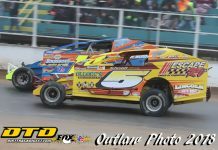 Zimmer finished second and earned $300 as the first representative from Thunder Mountain Speedway in Center Lisle, N.Y.
Kurt Stebbins, Tyler Yeagle and Gene Sharpsteen finished third through fifth, respectively. 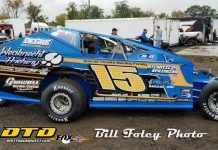 The inaugural American Racer Cup Street Stock Champion’s Challenge 15-lap event went to Lanson Albanese of Moravia, N.Y., representing his home tracks of Thunder Mountain and Skyline Raceway Park in Blodgett Mills, N.Y. Albanese earned $500. 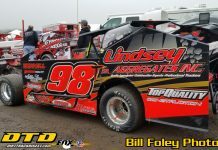 Will Ward of Cobleskill, N.Y., took home $500 from the 20-lap IMCA-Modified feature. 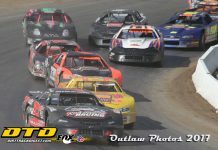 Ward pocketed the $400 winner’s share and an additional $100 as the highest-finishing Thunder Mountain Speedway regular across the line. 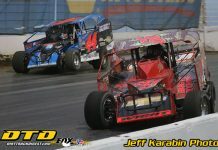 Jake Maynard, Tyler Stoddard, Gary Roberts and Ken Buck completed the front five. Mike Houghtaling topped the 15-lap Vintage Modified Open event. With 53 STSS Sportsman packing the pit area, Claude Hutchings Jr. won a thriller over Jimmy Wells to wear the “Working Man’s” hat after the 35-lap feature. The Paris, N.Y., driver earned $1,800 including the ‘Gambler’s Bonus’ of $500 and $300 from Dale and Sue Smith as the halfway leader. Hutchings actually lost the lead to Wells with only two laps remaining in the event. The race’s complexion changed as the leaders raced under the white flag. Wells made contact with a lapped car and ricocheted into the frontstretch wall. The incident caused damage to Wells’ Grasso family No. 19. Hutchings was able to re-pass Wells and race back to the win. Nick Nye also cleared Wells on the final lap, with Wells limping across the line in third. Nick Mady and Bill Deckelman completed the front five. 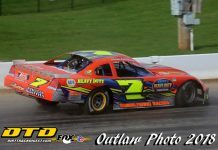 With his 10th-place finish, Corey Cormier of Otisville, N.Y., secured the STSS Sportsman championship. Friday’s event was the final leg of the five-race series. 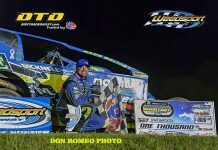 Candor, N.Y., driver Brian White, the champion at Thunder Mountain Speedway, topped the American Racer Cup Champion’s Challenge and received $1,000. 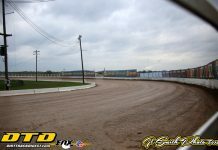 The CRSA Sprint Cars visited for a special $1,000-to-win feature event on Friday night sponsored by the Algonkin Motel and Mike Emhof Motorsports. 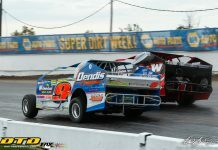 Bobby Hackel of East Greenbush, N.Y., held off the late-race advances of Josh Pieniaziek, Dustin Purdy, Dana Wagner and Jeff Trombley. 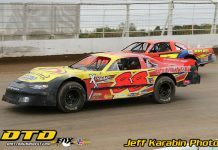 On Friday night, the 10 fastest drivers from timed Modified practice went to a Dash won by Alan Barker of Norwich, N.Y., who earned a redraw position for Saturday’s main event. The next four drivers shared in guaranteed 10th starting spots for upcoming events. 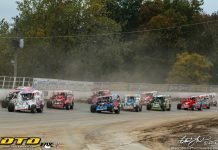 Dan Creeden picked the Orange County ‘Hard Clay Finale’ with Andy Bachetti taking the November 25‘Gobbler’ race at Accord (N.Y.) Speedway, Jordan Watson the big-block event October 28 at Georgetown (Del.) Speedway and Mike Gular the small-block event October 27 at Georgetown. Phil Burns bested the FWD Four Cylinder field for a $200 payday. AFTON AFTERTHOUGHTS: The 10th annual ‘Working Man’s Race’ drew a total of 188 race cars filing through the pit gate. 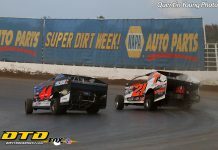 Additionally, 22 Modifieds took part in timed practice sessions on Friday night…. 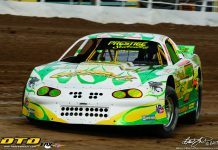 It was a memorable Saturday for the Ricci family: Allison, Mike and Rich Jr. all made the redraw through their qualifying heats…. The largest turnout to date of campers added to the weekend’s atmosphere…. As part of the American Racer Cup program, some 300 free tires were made available to participants of the program. 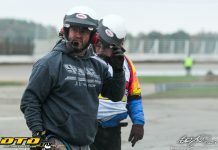 Dustin Leverknight represented Lias Tire/American Racer for the weekend…. 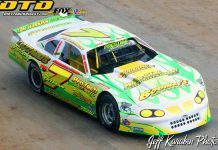 Bob Hilbert Sportswear Short Track Super Series Fueled By VP Halmar International Round No. 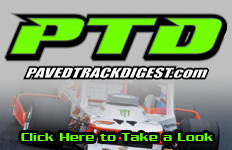 8 Modified Feature Finish (50 laps): RUSTY SMITH, Andy Bachetti, Mike Gular, Mike Ricci, Rich Ricci Jr., Bobby Varin, Nick Nye, Billy Pauch Jr., Jordan Watson, Brett Tonkin, Tommy Meier, Anthony Perrego, Allison Ricci, Danny Creeden, Billy Decker, Nick Rochinski, Jeremy Smith, J.R. Hurlburt, Steve Davis, Ken Titus, Chris Stull, Cory Costa, Richard Smith, Shaun Walker, Mitch Gibbs, Alan Barker, Craig Hanson, Kevin Jordan, Duane Howard. Did Not Qualify: Harold Humphrey, Ryan Watt, Lee DeWitt, Darwin Greene, Dan Pompey, Matt DeLorenzo, Nick Mady, Kyle Van Duser, Kevin Sockriter, Brett Barrett, Mike Clapperton, Bob Stahl, Jerry Higbie Jr., Ryan Jordan, Adam Hilton, Joe Judge, Tim Mayne, Dan Hineline, Ricky Newton, Rich Eurich, Steven Deinhardt, Frank Yankowski, Paul Jensen, Ray See Jr., Kurt Decker, Steve Young, Dale Welty, Shawn Ward, Brian Malcolm, Larry Mekic, Jimmy Wells. American Racer Modified Champion’s Challenge: RYAN WATT ($2,000) over Duane Howard, Billy Pauch Jr., Nick Rochinski, Andy Bachetti, Jordan Watson, Danny Creeden, Richard Smith and Dan Pompey. Trackside Products Street Stock Feature Finish (20 laps): DYLAN CECCE, Earl Zimmer, Kurt Stebbins, Tyler Yeagle, Gene Sharpsteen, Jerry Lobdell Jr., Shane Wolf, Dan Force, Jake Fowlston, Trevor Dudley, Dustin Harris, Damon Decker, Dave Cronk, Darren Cox, Zach Seyerlein, Bob Mills, Matt Bowman, Doug Polhamus, Chris Meshewske, Dan Mazzarese, Shawn Stalker, Shawn Boynton, Kody Sites, Lanson Albanese. American Racer Street Stock Champion’s Challenge (15 laps): LANSON ALBANESE ($500), Damon Decker, Dylan Cecce, Dan Force, Kody Sites, Doug Polhamus. IMCA-Modified Feature Finish (20 laps): WILL WARD, Jake Maynard, Tyler Stoddard, Gary Roberts, Ken Buck, Mike Stoddard, Eric Stumpf, Jeff Austin, Keith Lamphere, Beau Ballard, Gary Smith, Keith Jack Lamphere, Tony Harris, Billy Ward. Bob Hilbert Sportswear Short Track Super Series Fueled By VP Sportsman Feature Finish (35 laps): CLAUDE HUTCHINGS JR., Nick Nye, Jimmy Wells, Nick Mady, Bill Deckelman, Kenny Hammond, Mike Schane, Cody Clark, Brian White, Corey Cormier, Shayne Spoonhower, Dennis Clapperton, Kevin Jordan, Larry Mekic, Harold Humphrey, Jack Miller, A.J. Digsby, Craig Pope, Butch Klinger, Travis Smith, Matt Stangle, Chris Jordan, Hunter Lapp, Leo Fotopoulos, Allan Hodge, Tyler Hart, Steve Andersen, Cole Hentschel. Did Not Qualify: Don Hart Jr., Kevin Ward, Dan Burman, Tom Velez, Ryan MaCartney, J.R. Fulper, Craig Whitmoyer, Dave Rosa, Blaine Klinger, Bob Buono, Rich Ricci III, Brian Fish, Kenny Bock, Chad Ray, Kurtis Hohensheldt, Jerry Tonti, Mike Grover, Tim French II, Lisa Williams, Daniel Morgiewicz Jr., Rob Loucks, James O’Hara, Dennis Greenier, Eric Leet, David DeMorest. Dale & Sue Smith Halfway Leader Bonus ($300): Claude Hutchings Jr. Modified ’10-Spot’ Dash (10 laps): ALAN BARKER, Danny Creeden, Andy Bachetti, Jordan Watson, Mike Gular, Nick Nye, Paul Jensen, Dan Hineline, Steven Deinhardt, Mitch Gibbs (22 Modifieds were on hand). CRSA Sprint Car Feature Finish (30 laps): BOBBY HACKEL, Josh Pieniazek, Dustin Purdy, Dana Wagner, Jeff Trombley, Sydney Prince, Brian Krummel, Dalton Herrick, Tyler Boniface, Jerry Sehn, Chuck Alessi, Thomas Radivoy, Christian Rumsey, Kyle Smith, John Scarborough, Chloe Andreas, Peter Dance, Emily Van Inwegen, Billy Van Inwegen, Link Pettit, Leo Yeager, Rick Stone. FWD Four Cylinder Feature Finish (15 laps): PHIL BURNS, Mike Robinson, Tim Vandermark, John Mason.